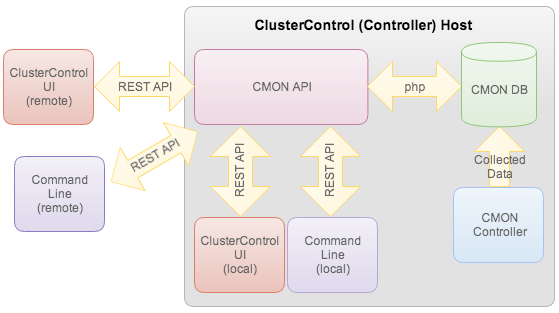 In this blog post, we will show you how to interact directly with the ClusterControl API to retrieve monitoring data or to perform management tasks. All requests against ClusterControl API URL should include the ClusterControl API Token as HTTP header (CMON_TOKEN) for authentication. 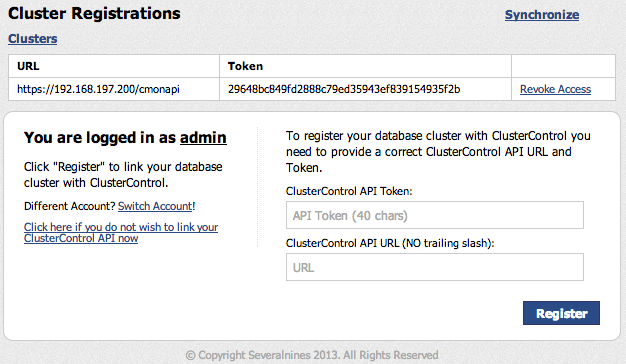 The ClusterControl API URL and token can be retrieved from the Cluster Registrations page in the ClusterControl UI. By leveraging the REST API, we can automate a number of things on our cluster - adding a node, creating a full backup, upgrading the cluster to a new version or performing a rolling restart. We have a two-node Galera cluster with a garbd co-located inside ClusterControl host. If the total queries is higher than 200/s for one minute, then a standby MySQL server (primarily, it is a DNS server) will be automatically started and added to the Galera cluster. Once the QPS is lower than 200/s for more than one minute, this node will be automatically removed from the Galera cluster. In this test scenario, we have actually added Galera #3 into the HAproxy load balancing set and when it joins into the cluster, it will automatically perform SST/IST and start serving up the cluster once synced. Good luck with automating your database infrastructure! echo "-i : cluster ID [default=1]"
echo "-r : retrieve data in JSON format"
echo "-j : post job to ClusterControl"
echo "-o : extra parameters when retrieve data"
echo "Counter: $i - $qps/$threshold - $date"
echo "!!! Firing up $ip - $date !!!" $cc_api -j "$ip $nodeid start mysqld"
echo "Host is already up"
echo "!!! Bringing down $ip - $date !!!" $cc_api -j "$ip $nodeid stop mysqld"
echo "Host is already down"